Diva Foodies is excited to introduce you to Kid Chef Ellie. Kid Chef Ellie is in the fourth grade and is 9, going on 10 in April. Like all of our other Kid Chefs she has a passion for food and cooking with her family. Making homemade pasta and creating delicious meals with her grandmother are favorite things for Kid Chef Ellie to do in the kitchen. A dream of Kid Chef Ellie was to be a part of Master Chef Jr. Ellie got her wish! During Season 4 of MasterChef Junior she became an honorary judge as part of Make a Wish Georgia. 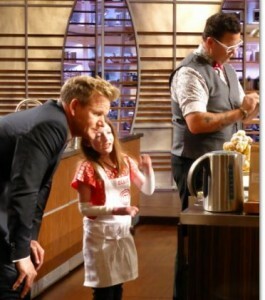 Our special thanks to Chef Gordon Ramsay for making a little girl’s dream come true. Please read more about Ellie at the end of the post. 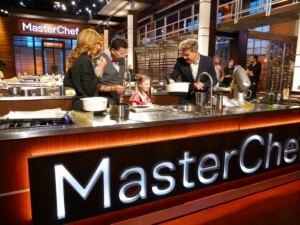 MasterChef Junior Chef Judges Christina Tosi, Graham Elliott, Gordon Ramsay welcome Kid Chef Ellie to the set! Diva Foodies: Do you remember the first dish you ever cooked or baked? Kid Chef Ellie: Hmmmm. I think I helped my grandmother make sweet potato casserole for Thanksgiving. I helped put the marshmallows and nuts on top! 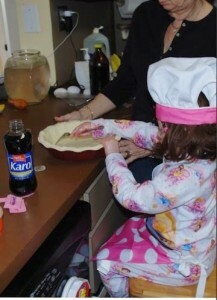 Kid Chef Ellie at 5 years old baking pecan pie with her grandmother. Diva Foodies: What is your favorite to cook or bake and why? Chef Ellie: My favorite thing to cook is pasta. Homemade pasta with alfredo sauce. 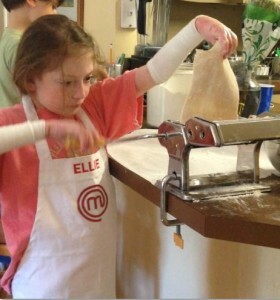 Kid Chef Ellie takes making homemade pasta very seriously! Diva Foodies: We heard you were a judge on MasterChef Junior. Way cool! What was the most fun about being on set? 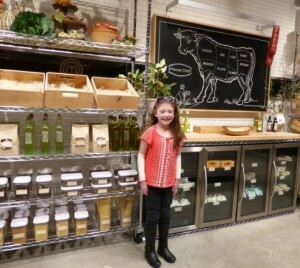 Big Smiles from Kid Chef Ellie in the MasterChef Kid Pantry. Kid Chef Ellie: Yes, through Make a Wish Georgia, I was a honorary judge on the show. The most fun was getting to taste the final dishes! Diva Foodies: Okay, Ellie we have to ask (!) What is Chef Gordon Ramsay really like? Kid Chef Ellie: He is so nice…..like a big kid and really funny. He has a lot of energy and talks very fast! 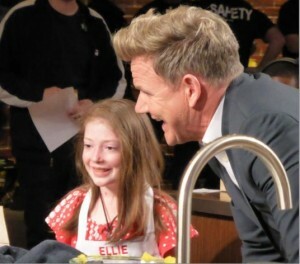 Wonder what cooking tips Kid Chef Ellie is telling Chef Gordon Ramsay. Kid Chef Ellie: My favorite kitchen tool is a pasta sheet roller. Homemade pasta is the best! And it’s really not that hard to make it. Kid Chef Ellie: I think I have too many to pick just one. I like Master Chef Jr. because I can’t believe that kids my age are making some of the difficult dishes they make. I like Kids Baking Championship for the same reason. My other favorite is Guys Groceries Games because the chefs have to think on their feet. All of them are competitions so that is probably why I like them. 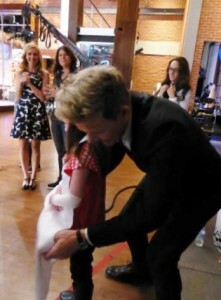 Chef Gordon Ramsay helps Kid Chef Ellie with her MasterChef Junior apron. Chef Christina Tosi seems to think it’s sweet. We do too! 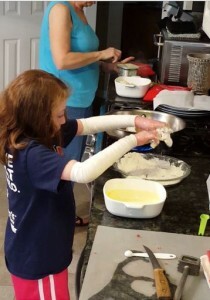 Diva Foodies: Mom Shawn when did you realize your daughter loved to cook and bake? Mom Shawn: Probably at the age of 3 or 4. She took an after school cooking class through her preschool and that was the beginning of it. She has always been interested in the ingredients of dishes and is open to trying new foods all the time. Diva Foodies: Anything else Kid Chef Ellie or Mom Shawn you’d like to add? Mom Shawn: Since her father and I love to cook, grill and bake, we love that she has that interest too. It’s something we can all do together and now that she is older, she likes to try to make one dinner each week for the family. It’s a really sweet thing that she is able to do and loves to do. We love it! Amanda Saab, contestant from MasterChef Season 6 sends Ellie good wishes – see comments. MasterChef Junior Finalist Zac Kara invites Ellie to cook with him in Orlando! The extra extra special “cherry on the top” was a tweet to Ellie from Chef Gordon Ramsay! Ellie was born with a rare genetic disorder called Epidermolysis Bullosa (EB). She is missing a specific collagen protein that acts like a glue which would adhere her skin to her body. It also affects her internal organs and can cause scarring of her skin as well as internally with her esophagus and other organs. Her skin is extremely fragile and wounds and tears easily…..like a butterfly wing. She wears special bandages that helps heal and protect her skin. Support Kid Chef Ellie! 10th Annual Butterfly Wishes for Ellie to Benefit Debra of America (a 501c3) at the Park Tavern in Atlanta on May 25, 2016. The public is welcome. Yacht Rock Schooner will be entertaining the crowd with sounds from the late ’70s and early ‘8os. There will be food, drinks and the opportunity to bid on cool silent auction items. Register today! For more information on Epidermolysis Bullosa, take a look at Debra. They are the only non profit that not only funds research for a cure and treatments, but also provides much needed support and resources for families who have a loved one who suffers with EB. For sponsorship opportunities please contact Ellie’s dad Andrew Tavani at butterflywishesforellie@gmail.com. Thanks for your comment and kind thoughts Amanda – from MasterChef!